We were thrilled to be asked to promote a fun giveaway to you guys! This Yum Earth Back To School Giveaway is a great way to start the year off right with healthier options for your kids lunch boxes! 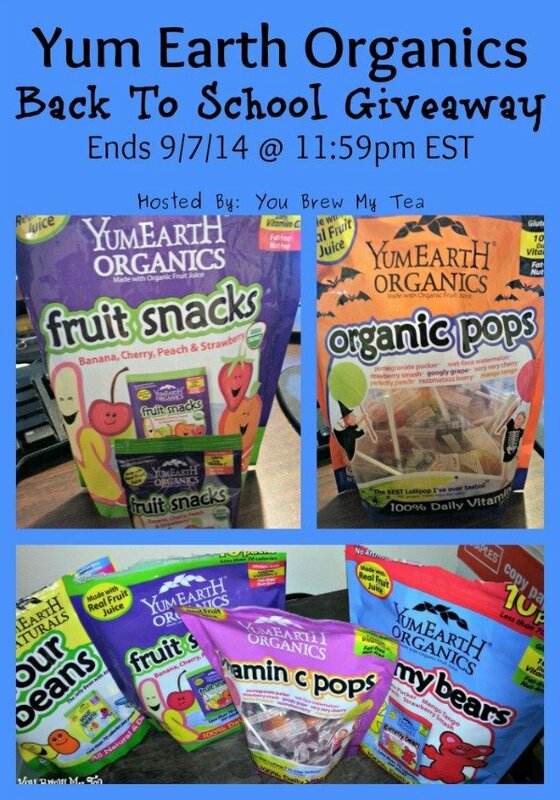 One winner will receive 2 Family Bags of the awesome variety of Yum Earth Organics treats. That will be 20 packs of treats to go in lunch boxes! A month of tasty, kid loved and mommy approved lunch box treats! We Heart Family and Friends is excited to be sharing this giveaway with all of you. Winner must be 18 or older. One Winner will receive 2 Family Bags of 10packs treats each! Don’t miss all the latest new products, sales and events at Yum Earth! Make sure to follow them on Twitter, Facebook and Pinterest to see all the best they have to offer! Enter Via Giveaway Tools Below! Disclaimer: The host blog may have received compensation in product for this post. Any other participating blogs did not receive compensation for the published material in this post. No purchase is required to enter this giveaway and there is a limit of one entrant per household. Void where prohibited. Odds of winning are determined by the number of valid entries received. Winner will be chosen via Giveaway Tools application and will be emailed via the email address used to enter the contest. New winner(s) will be chosen if original winner(s) has not responded within 48 hours of email notification. This blog and other participating bloggers are not responsible for shipment of prize(s). Sponsor(s) are responsible for all shipping costs related to prize(s). This giveaway is not administered, sponsored, endorsed by, or associated with Facebook, Twitter, Google, Pinterest or other social media outlet. Disclaimer is posted in accordance with the Federal Trade Commission 10 CFR, Part 255 Guides Concerning the Use of Endorsements and Testimonials in Advertising.